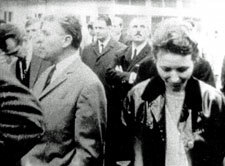 In 1967, Chris Marker and Mario Marret (under the aegis of SLON) produced A BIENTOT J'ESPERE, which documented a strike and factory occupation-the first in France since 1936-by textile workers at the Rhodiaceta textile plant in Besancon, the goals of which prefigured many of the demands that would come to define May 1968. Many of the Rhodiaceta workers who had collaborated with Marker and Marret on the film were unhappy with the final production. In response, Marker and other SLON filmmakers reorganized their efforts to begin training workers to collaboratively produce their own films under the name "The Medvedkin Group", after the Russian filmmaker Marker would later memorialize in THE LAST BOLSHEVIK. CLASS OF STRUGGLE is their first production. Picking up in Besancon a year after the events depicted in A BIENTOT J'ESPERE, the film focuses on agitation by workers at the Yema Watch Factory, particularly the efforts of one recently radicalized worker, Suzanne Zedet. Zedet describes her political activity, and the punishments issued in response by the factory management. She also articulates the radical scope of her and her fellow workers' demands, which go beyond higher wages and better benefits, and reflect a desire to reorganize the country's economy and social order. One of those demands is access to culture and to the tools of cultural production. The film itself is one attempt to meet this demand, and we see the workers editing and developing film under a banner that reads: "Cinema is not magic; it is a technique and a science, a technique born from science and put in service of a will: the will of workers to liberate themselves." One of the most radical films produced in an era defined by radicalism, CLASS OF STRUGGLE reflects this will to liberation. 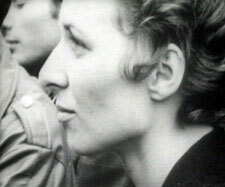 In Chris Marker's film, workers at a textile factory on strike in pre-May '68 France, not just for more money, but for a different way of life.